Summer is here once again, and with its arrival comes more than just the beautiful weather. It’s also the season for ants. Ants in our homes, ants in our yards and because ants love to play in the sandbox, for many of our children, ants in their pants! As children, my friend Rachel and I always had a blast in her sandbox. We mastered the art of making mud pies and ruined all of her brother’s matchbox cars. Somehow they didn’t seem to move quite as fast with sand in their tires! It never seemed to fail, though, that our good time in the sandbox became short lived when ants started to run up our legs. It ended the same way each time. We’d jump out, screaming for the hose, as her brother stood by silently smirking — pleased with the payback and the entertainment the ants provided. While he got quite the kick out of these little ant attacks, our parents didn’t find them so humorous. They were far more concerned about the danger Rachel and I faced, than the scary tickle that we seemed to think was the worst part. Once the ants have found your child’s sandbox, it can certainly seem like they’ve made it their home. The question becomes, is it really such a big deal that they have moved in? 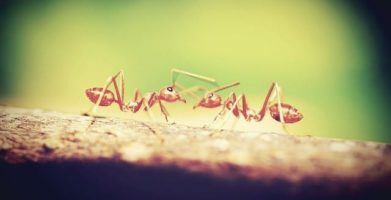 Depending on the type of ant, it can be a big deal — especially if the child is allergic to ant bites. Parents who live in the southern part of the United States should be concerned about fire ants. The risk from these red ants is the venom secreted when they bite. Although the average human will only get a swollen bump for a few days, this bite can be deadly to a child who is either allergic or has gotten multiple bites. If you are a parent who lives in the western part of the United States, particularly California, keep an eye out for Argentine ants. These ants are sneaky and will bite for the fun of it. So, if you have a curious little one who gets into everything, especially a cool ant hill that looks irresistible to step on, watch out for these golden brown ants. Carpenter, House, and Pavement Ants can be found anywhere you can find older wood, a house or inside structure, and pavement. Pavement Ants are the ones whose mounds you see all over sidewalks and driveways. Keeping your curious kids away from the mounds can be hard, but Pavement Ants will sting when provoked. House Ants can be found anywhere in your house or indoor structure. They will not sting you or your kids, but they do pose the possible threat of contaminating food from their waste. Carpenter Ants can be found in wood — in tree trunks, piles of firewood, or in the wood of a sandbox. They are very territorial and will sting if they are disturbed. So, why do ants hang out in the sandbox? 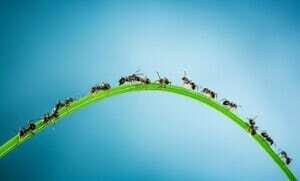 Ants live to make the perfect mounds for their colony. A mound or “ant hill” is like their version of our homes — safe, and out of the elements. They find the best material possible for their structure and never stop working. A sandbox is a one stop shop for ants. They don’t have to go anywhere to build when they can just live in your child’s play area. Sandboxes also attract other insects, so they not only provide the perfect shelter for ants, but a stocked kitchen! Ants love to feast on pretty much anything that they can get their 6 legs on. And if they want a sweet treat, no problem. Your kids probably left that behind — in the form of spilled juice boxes. How can you help your kids play in the sandbox without the company of ants? Clean the inside of the box to get rid of any bug eggs. Replace the old sand with new sand. Line the bottom of your sandbox with landscaping fabric. This fabric is a thin, breathable, black fabric used predominately for gardening and can be found in any hardware or gardening store. It allows water to still flow through, but prevents ants and other bugs from getting in through the bottom. If you have ants in your sandbox, but they haven’t found their way into your home, it’s only matter of time until they do. Ants are very tiny and have no problem attaching themselves to clothing or hitching a ride in your child’s pocket. If you do discover an ant infestation inside of your home or other structure, StayAway Ants® has got you covered! While the natural botanical fragrance is pleasing to humans, ants find the scent to be unpalatable. They know if they bring food back to their colony that has been exposed to the smell, they’ll be rejected and they certainly don’t want to lead their colony back towards the scent. All they want is to keep their family safe, (who could blame them!?) and will be left with no other choice but to find their way back outside for food and safety. earthkinds® products are all-natural, and unlike the ants, they won’t harm your little ones, if they somehow manage to get their hands on them. Summer is here once again, and with its arrival comes more than just the beautiful weather. It’s also the season for ants. Ants in our homes, ants in our yards and because ants love to play in the sandbox, for many of our children, ants in their pants! As children, my friend Rachel and I always had a blast in her sandbox. We mastered the art of making mud pies and ruined all of her brother’s matchbox cars. Somehow they didn’t seem to move quite as fast with sand in their tires! It never seemed to fail, though, that our good time in the sandbox became short lived when ants started to run up our legs. It ended the same way each time. We’d jump out, screaming for the hose, as her brother stood by silently smirking -- pleased with the payback and the entertainment the ants provided. While he got quite the kick out of these little ant attacks, our parents didn't find them so humorous. They were far more concerned about the danger Rachel and I faced, than the scary tickle that we seemed to think was the worst part. Once the ants have found your child's sandbox, it can certainly seem like they’ve made it their home. The question becomes, is it really such a big deal that they have moved in? Depending on the type of ant, it can be a big deal -- especially if the child is allergic to ant bites. Carpenter Ants can be found in wood -- in tree trunks, piles of firewood, or in the wood of a sandbox. They are very territorial and will sting if they are disturbed. Ants live to make the perfect mounds for their colony. A mound or "ant hill" is like their version of our homes -- safe, and out of the elements. They find the best material possible for their structure and never stop working. A sandbox is a one stop shop for ants. They don’t have to go anywhere to build when they can just live in your child’s play area. Sandboxes also attract other insects, so they not only provide the perfect shelter for ants, but a stocked kitchen! Ants love to feast on pretty much anything that they can get their 6 legs on. And if they want a sweet treat, no problem. Your kids probably left that behind -- in the form of spilled juice boxes. If you have ants in your sandbox, but they haven’t found their way into your home, it’s only matter of time until they do. Ants are very tiny and have no problem attaching themselves to clothing or hitching a ride in your child's pocket. If you do discover an ant infestation inside of your home or other structure, StayAway Ants® has got you covered! While the natural botanical fragrance is pleasing to humans, ants find the scent to be unpalatable. They know if they bring food back to their colony that has been exposed to the smell, they’ll be rejected and they certainly don’t want to lead their colony back towards the scent. All they want is to keep their family safe, (who could blame them!?) and will be left with no other choice but to find their way back outside for food and safety. string(31) "Get Rid of Ants in Your Sandbox"